Abbott acclerates his steep decline as he sacks Ruddock and further trashes his own record. Like a fart in a pickle barrel the Federal Coalition reverberated from crisis to catastrophe in a woeful week in which everything went wrong again, perhaps its worst week yet, a week which began with the PM’s rude April Fool’s-Valentine card Monday’s ballot on his leadership where he made history by narrowly beating off a challenge from an empty chair to his Friday last minute sacking of Father of the House Ruddock while proclaiming profusely his undying friendship and esteem for his mate. Hate mail from former supporters continued unabated. The Daily Telegraph’s Samantha Maiden, dubbed Peta Credlin ‘the nation’s first female Liberal Prime Minister — unelected, mind you — that we never knew we had.’ Credlin, was, however, Abbott’s ‘one unmoveable chess piece,’ he said, besides, she was far too powerful to be a PM, although he was keeping her out of Cabinet and the advisors’ bench in the House while the fuss all blew over. Bugger Ruddock. Credlin was loyal. ‘Not the right move,’ Julie Bishop bristled and archly briefed the media that Credlin was ‘a powerful figure’ who was ‘full of opinions’ and her boss was ‘a smart man’ who could join the dots. Flattery will not get you everywhere, however and Bishop accordingly threw in, for good measure, her character assessment of her boss, made to his face in a full and frank screaming match earlier. ‘You are you own worst enemy, Tony’. In Tuesday’s joint party room meeting, those present had Credlin in their sights when they brought a motion to sack any staffer who ‘backgrounded’ against a minister. Nothing was said about a briefing backstab, Bishop had noted on her legal notepad. Dumping Ruddock was all about fostering stronger bonds with the backbench. It was renewal, Abbott explained, thankfully avoiding using the reset button image but fooling no-one. He had knifed Ruddock last thing Friday, as he and Peta put out the trash and tidied up the office. Ruddock had not whipped up enough support for his leader in the spill. It was a novel, perhaps, dangerous interpretation of the role of Chief Party Whip and risked conflating party with leader but at least the new boy Scott Buchholz would have a real whip to crack even if many saw him as a National Party hick in origin and for sundry other reasons would have no real dealings with him. Rabid Abbott flatterer Tasmanian MP Andrew Nikolic has also been elevated to government Whip. Nikolic, an effusive supporter of the Prime Minister since entering Parliament in 2013 would be guaranteed to nurture the views of all fellow sycophants as he skilfully forges consensus between backbench and leader. His promotion should also clear up some of the delay in news of dissent reaching the ears of the PM, a problem which appears to have bedevilled his administration lately. The PM’s use of ‘renewal’ really meant reverting to a ‘command and control regime’ with bullying as required, for example in his hysterical attack on Gillian Triggs for daring to publish a report critical of his government. She was a shameless political partisan, he bellowed and he later got Brandis to send round a message boy telling her she should resign, another alarming precedent in ‘good government,’ as it was a complete breach of etiquette. Malcolm Fraser stuck up for Triggs and deplored Abbott’s bullying in the press. ‘Stronger bonds’ meant more bullying: he would put those backbench bastards on a tighter leash. The old junkyard dog was back and bigger than ever. Whilst the shafting of Ruddock caused uproar, it was not enough, in itself, to be the ‘next big mistake’ a cabinet member had predicted would terminate Abbott’s leadership and the message to move on was put out by Rupert’s new friend Julie Bishop who proclaimed on the Tuesday: ‘Leadership challenges are so yesterday.’ Or tomorrow. Some insiders claim that 47 votes for Turnbull could be counted now with others accruing as the PM’s latest captain’s call alienated the party. Popularity plummeting, party unity unravelling, policies in tatters, the Abbott government proceeded to struggle to govern itself, let alone govern the country. Its messages were a flip-flop flapdoodle of contradiction, inconsistency and lunatic denial. Its cabinet members were confused and dazed; its backbench bolshie. ‘Must cut government spending,’ Hockey spluttered but Abbott had tax cuts, jobs and undisclosed family-friendly bribes in mind for the budget. Higher education costs or some of them would be discounted in a predicted ‘softening’ of unpopular policies. Pyne turned his considerable energy to kicking the standards can and would also kick a few heads to see that beginning teachers were literate and numerate or he would personally confiscate their chalk. The government’s only plan was to keep repeating inanely that it had a plan. Where was it? Where was party discipline? Sack the whip? Some see The Whip’s dismissal as scapegoating. Incapable of responding to its leadership crisis the LNP opted for an easier target and shot the messenger. Cadaverous, slow moving Party Whip and longest serving Liberal MP, Philip Ruddock, is clearly pacing himself for the record books. Only ‘The Little Digger’ with a 51 year stint, stands between Ruddock and the record books. Hughes was also not very tall attesting perhaps to the longevity of smaller targets. Many cannot forget nor forgive the bloodless Ruddock’s stint as John Howard’s Minister for Immigration where babies were said to be thrown overboard among other whopping lies to demonise asylum seekers arriving in leaky boats. ‘Turn back the unworthy illegal queue-jumping bastards’ became a popular talkback line and has since cemented into a bipartisan policy, excluded only by Section 18C from official documents. Yet this ritual bloodletting has only weakened the patient. Outrage is mounting amongst emotional party members who equate Ruddock’s despatch with the slaughter of the water buffalo in Apocalypse Now as an unforgiveable act of gratuitous cruelty. Abbott, doubtless, would be Kurtz in this scenario. Regardless of his ‘tough on boats’ history as a Howard heavy and for many, because of it the worthy time-serving Nestorian Ruddock enjoys some standing as a type of counsellor and mentor. Feelings are running high. Abbott’s latest poorly judged captain’s flick may prove his final undoing as he struggles to do anything at all successful in the dog days of his Prime Ministership. Cabinet members bicker. Parliamentary debate degenerates into denouncing Labor in a desperate last-ditch bid to win back credibility by its rattled leader. ‘I can beat Bill Shorten,’ boasted the PM on Monday. The nation’s naysayer’s naysayer is incapable of interpreting the results of his leadership spill motion beyond a signal to go back on attack. Yet a week earlier, at the Press Club, the leader was promising a new era of consultation, collegiality and candlelit suppers. No wonder the LNP eyes its crazily erratic leader warily, wondering if it is now is the right time to put its slathering junkyard dog out its misery before it sinks its fangs into another postman or woman. 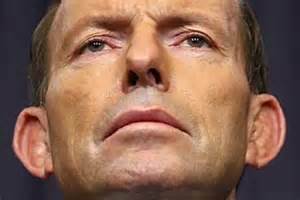 « Abbott’s promise of good government proves hollow.